Case : A 40 yo male with severe recent onset headache. On admission Plain CT study show hardly any obvious abnormality, except marginal fullness of lateral ventricles - a subjective finding. MR Axial FLAIR study of brain performed immediately after that shows abnormal hyperintensities in the region of hemispheric cortical sulci. T2*GRE and Diffusion normal. 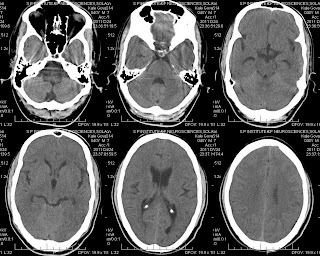 MR Angiography and Venography of Brain normal. So the final Impression was "Diffuse sulcal hyperintensity on FLAIR" as the only important positive finding in the study. Possible DDs suggested were SAH and Exudates of Meningitis. Csf evaluation strongly supported SAH. DSA performed 4 days after also could not reveal any obvious cause of SAH. • Stands for 'Fluid Attenuated Inversion Recovery' Sequence sequence has become a routine part of MRI studies of the brain; rather it has become the most commonly used sequence in MRI brain studies. In some institution like ours it is performed as a screening study for brain in cases of emergencies and non affordable patient. • An inversion recovery pulse to null the signal from CSF and a long echo time to produce a heavily T2-weighted sequence. Produces images highly sensitive to T2-weighted prolongation in tissue but minus the Csf. Improves detection of lesions within the subarachnoid space and brain parenchyma, particularly the lesions located near the brain–CSF interface. • When disease occurs within the subarachnoid space, the relaxation time of CSF is altered, result in hyperintensity of the CSF or subarachnoid space during the FLAIR sequence. Commonly seen in dependent portions of brain in parieto occipital region with effacement of cortical sulci, an alternative term cerebral odema can be used to describe this associated finding. •Common causes of such non specific diffuse hyperintensity along sulcal space is Meningitis and Subarachnoid hemorrhage. • In meningitis and SAH both the higher protein content and cellular concentrations causes an offset in the null point of CSF inversion times, resulting in increased T2-weighted prolongation. 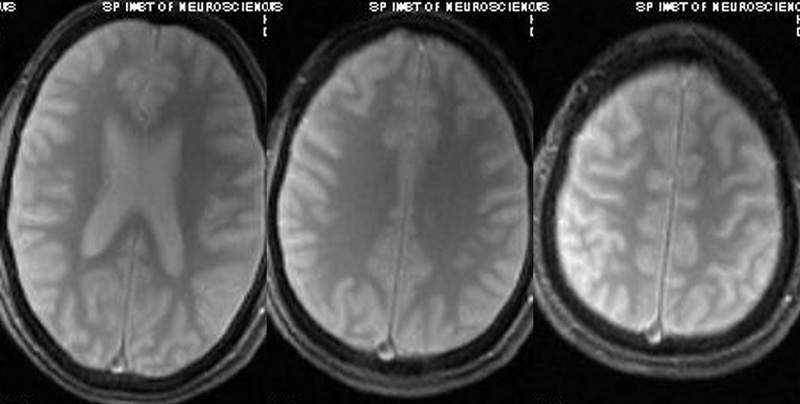 • In massive SAH or obvious Meningitis with exudates and hydrocephalus diagnosis may not be a problem but in subtle cases, results of both in vivo and in vitro studies have suggested that FLAIR imaging is more sensitive than CT in the evaluation of these milder and subtle form of acute SAH and meningeal inflammation in which cases where CT may show only mild effacement of cortical sulci. 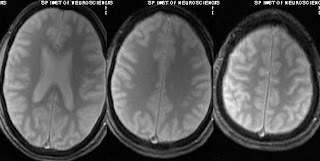 T2*GRE has not role in cases of milder forms of sub arachnoid hemorrhages, may be normal as in above case. Differentiation between the two is difficult most of time and is out of imaging consecus. Contrast enhanced T1 or Flair may help out by demonstrating leptomeningeal enhancement in meningitis. • Always keep in mind other, less common cause of subarachnoid space FLAIR hyperintensity is artifact. In my institution one patient was advised brain axial FLAIR and sagittal T2 cervical spine screening. First brain screening was performed, which was showing similar abnormal diffuse non specific hyperintensity along sulci spaces and basal cisterns. Cervical spine screening performed and axial Flair repeated again. It is strange to mention that this time axial flair screening was absolutely normal. I had two such incidences. After discussion with my technician i came to conclusion that this was artifactual as some changes were done by him in hurry in TR TE during the study. Patient intubated and on inhaled O2 can show similarPatient intubated and on inhaled O2 can show similar abnormal diffuse hyper intensity in the region of cortical sulci and basal cisterns due to para magnetic effect of dissolved oxygen. Conclusion: Most of the time an associated finding may suggest the cause of the subarachnoid space hyperintensity on FLAIR. But in cases of milder form, diffuse distribution and a lack of ancillary findings often make this finding nonspecific and may require clinical correlation and CSF analysis. It’s better to mention the finding and suggest csf analysis. Commonest causes of diffuse sulcal hyperintensity on FLAIR include Meningitis and SAH. Intubated patient on inhaled O2 can show similar picture due to para magnetic effect of dissolved oxygen.